The Self-Cath Straight Tip Catheter family of latex-free catheters offers patients a variety of options for intermittent self-catheterization. Each catheter is made with the highest quality standards dedicated to patient co1mfort and ease of use. 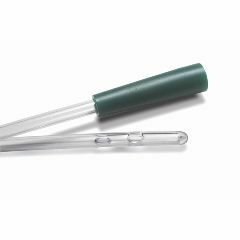 The Self-Cath Straight Tip Pediatric Intermittent Catheter is 100% latex-free with fire-polished eyelets and a siliconized surface for smooth insertion. Self-Cath Pediatric catheters have been designed to accurately fit pediatrics. Founded by a nurse in 1957 in Denmark, Coloplast's reputation for innovation has been built by working closely with health care professionals and end customers to develop new products. We value input and are eager to maintain a regular and meaningful dialogue to continue our heritage of innovation and service. Catheters are fine, been using them for 20 years. However I am not happy that Allegro takes them out of the box. I'm guessing this is to save money on shipping or storage. I will continue to use these catheters but will NOT be ordering them from Allegro. Just what we were looking for for our daughter! Thank you! Is it possible to get this catheter in 6fr or 8fr?